Throughout the past two days, Israeli forces have been raiding the grounds of Ofer prison, near Ramallah City, central occupied West Bank, and violently attacking Palestinian prisoners. 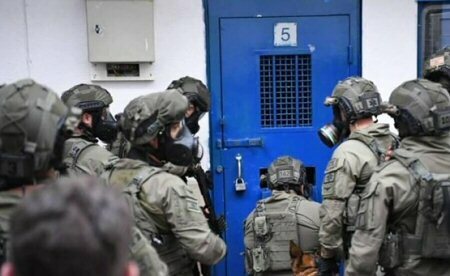 According to Palestine Prisoner’s Society (PPS), the two-day raid carried out in the prison has included attacking Palestinian prisoners with dogs and tear-gas bombs, resulting in over 100 injuries. PPS confirmed, according to Ma’an, that a large number of the injured prisoners were transferred to hospitals for medical treatment. As a result of the raids and the unjust treatment, Palestinian prisoners at Ofer decided to refuse meals and were on high alert, in case Israeli forces and prison guards were to carry out further raids, which would lead to further escalation. PPS mentioned that the prisoners at Ofer refused a request, by the prison administration, to meet with them, and insisted that the administration should first lift the ban on the movement of prisoners inside the prison, in order to meet and agree on a strategy for the meeting. According to prisoners rights group Addameer, there are 5,500 Palestinian prisoners currently being held in Israeli prisons, of whom 480 are in administrative detention, without charge or trial. 54 are female prisoners, 230 are child prisoners and 41 are under the age of 16 years.